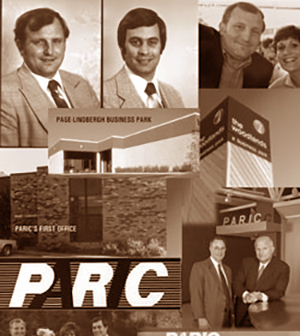 This week marks the 40th anniversary of St. Louis-based contractor PARIC Corporation. The company has grown from 2 employees to today’s 300-plus team. After opening an additional office last year in Kansas City, the company continues to expand both in size and revenue. Last year PARIC reported $522 million in revenue, making PARIC one of the largest privately held companies in the Midwest. PARIC Corporation was founded in 1979 by Paul J. McKee, Jr., and his wife Midge, and by Richard F. Jordan and his wife LaVona. The name PARIC is an acronym for the combination of the first names of the founders: Paul and Rick’s Company. After much discussion and initial brainstorming, the partners agreed on a clear vision for a then-unique type of construction company — specializing in design-build projects and tapping the power of then-new technology to deliver construction projects in a timely, efficient way that hadn’t been available before to building owners. Paul and Rick began their business in a small Westport area office with the credo of “People Make the Difference.” During the early days, the founders’ families took turns cleaning the company office and warehouse with help from their children, one of whom, Joe McKee, is PARIC’s owner and CEO today. PARIC now specializes in senior living, healthcare, historic renovation, hospitality and multi-family residential, public and academic projects, as well as interior specialty projects. The company manages construction projects for long-term and repeat clients ranging from universities and banks to hotels, restaurants, warehouses and trade centers.